Thangka des Buddhas Shakyamuni, umgeben von vielen weiteren Buddhas und Tathagatas, sehr sorgfältig als rotgrundähnlicher Thangka und unter Verwendung echten Goldes gemalt. Thangka of the Buddha Shakyamuni, surrounded by many further Buddhas and also some Tathagatas. 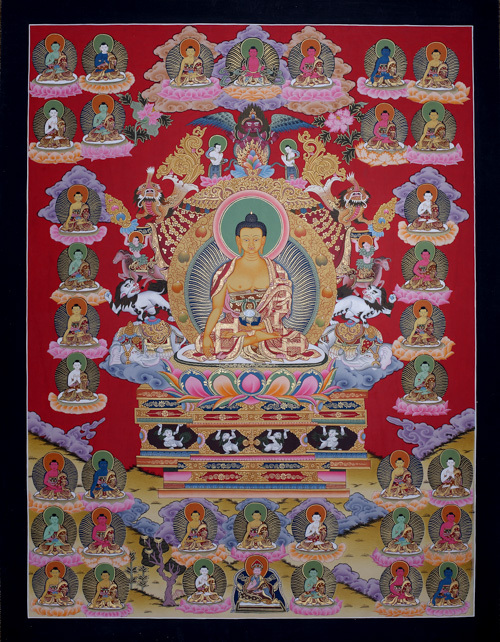 A very carefully painted thangka, similar to a red background thangka. Thangka-painting with the use of real gold.